Ray has been with Taylor’s Removals for over 50 years, and his experience and knowledge of the moving business is truly immeasurable. He was integral in the formation of the Chess Group, which gives Taylor’s national and international relocation capability through this partnership of independent removalist businesses. He represents the third generation of Taylor’s in the family business. Ray has seen the industry change from the use of ledgers to computers; single-axle trucks to semi-trailers; drivers sleeping under trucks while on long trips to motel accommodation; and the transition to ‘containerisation’ of storage and inter-state moves. He has many stories from his decades with Taylor’s, but highlights include the 12 days he spent with a truck bogged on the Nullarbor Plain on Taylor’s first Western Australian relocation; following the fence-line to Birdsville (as there was no road), taking trucks over to Tasmania on the ferry, and attending the British Association of Removers conferences all over the world. Ray began at Taylor’s as a Junior Warehouseman in August 1966, after a couple of years as a Clerk at the Commonwealth Bank. He then became a Removalist, then progressed to a Removalist/Driver. In 1978 he moved into the Office as the Operations Clerk and went on to become General Manager in 1986 and Managing Director in 1994 until his retirement from full-time operations in 2010. 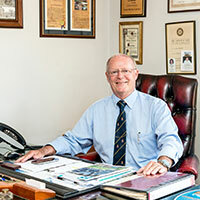 He is now the Chairman of the Taylor’s Group Board, as well as Chairman of Chess Moving Australia (since 2007); Board Director of Queensland Road Transport Association (Past President); Life Member, Australian Furniture Removers Association; and Past State Chairman Australia Mover’s Institute. Ray has always been active in the Toowoomba community and serves as Chairman of the Toowoomba Hospital Foundation; Deputy Chairman of the Rotary Bowel Scan Committee; Vice President of the Range Probus Club; and Chairman St Theresa’s Parish Council. He is also a Knight in the Order of St. John, a Justice of the Peace and is a Paul Harris Fellow. Ray is a Past President of the Toowoomba Rotary Club and served several years on the Board of Management for Fatima Home for Children and the Local Ambulance Committee.